This dirty rice dressing recipe is the perfect spicy Cajun side dish for your holiday table! It’s easy to make and incredibly flavorful. This post is sponsored by Tony Chachere’s – thank you for supporting the brands that keep Salt & Lavender cooking! I only work with brands whose products I love. All opinions are my own. When Tony Chachere’s approached me to create a holiday side dish using their products, I was very interested because I love Cajun and Creole cuisine. Louisiana is one of the places on my travel bucket list – mostly because of the food! I used Tony’s Creole Dirty Rice mix to make this awesome dirty rice stuffing. Tony Chachere was a Louisiana cooking legend, and his namesake products make Cajun cooking more accessible to those of us who are less familiar with Southern Louisiana cooking. I love a good shortcut, especially during this busy time of year. The rice is perfectly seasoned so you don’t need to worry about adding extra spices. It’s a practically-from-scratch dish that saves a decent amount of time. This dirty rice dressing can be served as a side dish or stuffed in a turkey or chicken. 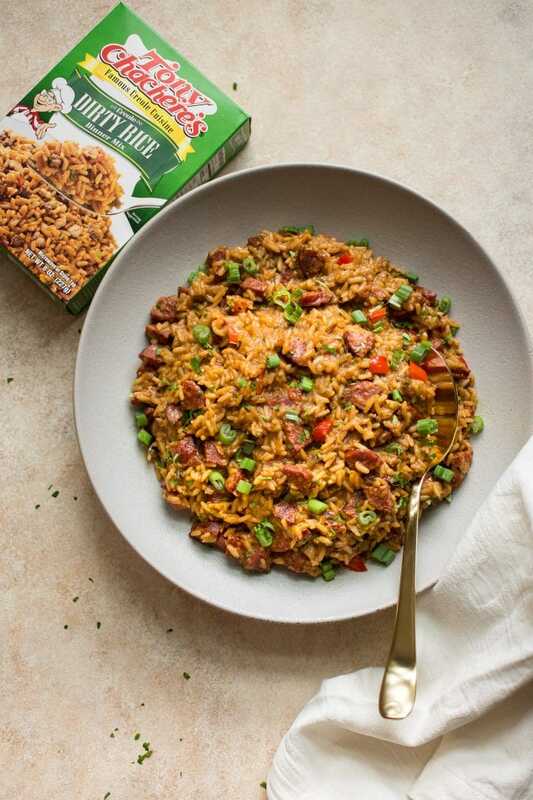 If you’re unfamiliar with dirty rice, it’s a traditional Creole comfort food dish that gets its characteristic “dirty” color from the ingredients it’s often cooked with. Andouille sausage is a smoked pork sausage that originated in France and was brought to Louisiana by French immigrants. It’s a popular ingredient in Creole cooking. 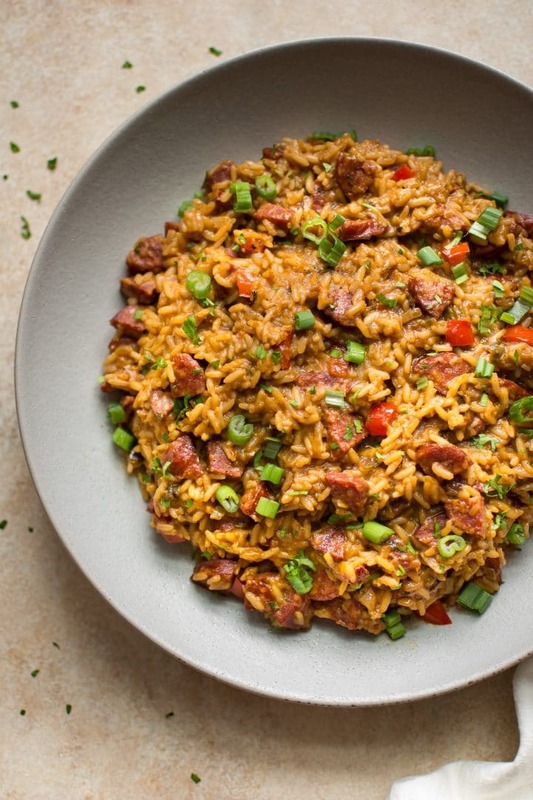 What can I substitute for andouille sausage? If you can’t find andouille sausage at your local grocery store, chorizo (especially the Mexican variety) is a good substitute. Kielbasa would also work in a pinch. Add chopped onion and celery to a fairly large pot and sauté in the butter and oil. Add the sausage and continue cooking for another 5 minutes. Add the garlic, followed by the chicken broth/stock, Tony’s Dirty Rice Mix, breadcrumbs, and red bell pepper. Bring it to a boil and then reduce the heat, cover the pot, and let it cook for about 25 minutes (stirring occasionally so the rice doesn’t stick) or until the liquid is mostly reduced and the rice is nice and tender. Hope you love this Creole rice recipe! This dirty rice dressing recipe is the perfect spicy Cajun side dish for your holiday table! It's easy to make and incredibly flavorful. Add the butter, olive oil, celery, and onion to a pot over medium-high heat and cook for 5 minutes, stirring occasionally. Add the sausage to the pot, and cook for another 5 minutes, stirring occasionally. Stir in the chicken broth, Tony's Dirty Rice mix, breadcrumbs, and red pepper. Bring the mixture to a gentle boil, and then reduce the heat and cover the pot so it's simmering. I suggest medium-low heat, but you may need to turn it down even more if it's simmering too rapidly. Cook for 25 minutes or until the rice is tender and the liquid is mostly soaked up. I like to give the dirty rice dressing a stir several times throughout cooking to ensure it doesn't stick to the bottom of the pot. Garnish with scallions and parsley and serve immediately. You know I’m a huge Tony’s fan Natasha! This looks just delicious. A nice and spicy dish that is sure to be a hit at our house! Can’t wait to give it a go! Love the video too! Thank you, Mary Ann!! I definitely enjoyed it. Hope you give it a try! Love love love creole comfort food, this looks awesome!